The authorities of the local Government Medical College (GMC) are reported to be hopeful of the situation. A certificate by the college authorities has been submitted to the Union Ministry of Health underlying the fact that the work had been initiated to overcome shortcomings at the college, and be prepared for the next MCI inspection. These shortcomings were listed by a team of the Medical Council of India (MCI) inspection in 2015. The work at the college broadly focuses on addressing issues of staff and infrastructure shortage for increasing the number of MBBS seats. Putting the MCI recommendations on a fast track mode, the ongoing work at the college is likely to be completed in the next eight months. As reported by Tribune, Principal of the Government Medical College, Dr BS Bal, said, “The MCI has given us a month’s time to remove the shortcomings. We are already on the process and work has been initiated to remove deficiencies.” He said the work would be completed before the MCI team visits the GMC for a re-evaluation inspection. 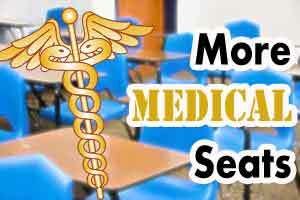 Earlier, in December last year, a four member MCI team had raised objections over the proposal of increasing the MBBS seats citing staff and infrastructure shortage. Dr Bal said most of the objections raised by the MCI team were of minor nature. The work was started immediately to improve infrastructure, he added. The Principal said the work on two building blocks and a students’ centre was also going at a fast pace and the project would be completed within a span of eight months. He said various new facilities were added at the college in recent years, which added more weight to the proposal for increasing MBBS seats at the medical institute.